5 x Rayons de cerceau - Faites le vous même! Trop de choix? Besoin d'aide? Cliquez ici! Do you have a passion for Hula Hooping? Hooping is a great way of having fun while at the same time doing exercise. What more could you want? So many choices, LED hoops, Fire hula hoops, breakdown or coil down hoops making travelling with your favourite gear easier and we have them all! Along with our range of DVDs and free online lessons to go with your hula hoop, you can have hours of fun learning, exercising or performing with friends. Gain great skills to impress your friends or get really flashy with an LED hula hoop, even going to another extreme with fire hooping. Get your hips moving and do some hooping. "Awesome service! Delivery was fast and the hoop is lovely, thank you :)"
"Fast response to queries. Helpful. Fast delivery. Good product. Love my hoop!" Just opened! It is as expected! "Only had the time to check it built and, besides the warnings from HOP, which is so concerned about giving all the right info and description (which I love and appreciate a lot for the honesty and precision), its shape is very round!! I tried both sizes (with 6 and with 5 pieces) and I am short so with five feels better for me! I am a beginner and I can't tell much about technical things on how it feels doing the movements (I tried isolation and it was the first time I got it!!!). The parts are a bit hard to separate and I broke my nails trying, so I did it holding something in the hole to push the click-thing down." "So pretty! The standard size is good for a smaller person so if you are bigger definitely go for a bigger size. So many pretty light functions on the control. I didn't realize I should disconnect hoop when not in use or it might turn on /off randomly... 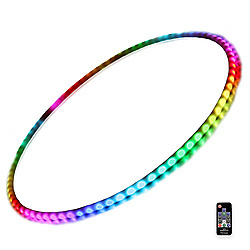 Customer service was very helpful when I messaged them, concerned that my hoop had a life of it's own _ This hoop is recommended and honestly I might order one more so I don't have to share with my kiddos anymore"
"She loved it. Looking forward to the next music festival." "I have researched many LED hoops for a unit that was a good value... I was very excited about the Valo hoop for a granddaughters birthday gift! I'm blown away by the patterns and features of this hoop! Everyone enjoyed and wanted one for themselves. A great HIT! I'm going to purchase more for my other grandkids..."
"Best bang for ya buck!" "I dropped into the Christchurch store when visiting and was stoked to be able to buy exactly the hoop I wanted right then and there from the very friendly and helpful staff! The hoop itself is very sturdy and reliable and I love all the features. Strong light, LEDs work great. I ll be using it for when I compete in the Australian Burlesque Festival so I couldn t be happier with my purchase! Thank you Home if Poi!!" "I love using Home of Poi as my go to for ALL flow items I have purchased to date. The service is always super fast - and I have requested orders to be delivered all over the world as well. I have been more than happy with my fire pois, LED pois, LED batteries, hula hoop and also replacement strings required for my pois as well. It's amazing to travel all over the world and have people ask me where I got my flow items from. I am always recommending Home of Poi as you have such a great range of products and the postage always comes super fast. Also being from NZ its cool to represent myself from being there and also a company that is based in the same country as well :) Thank you for always being consistently AWESOME! Peace Jonelle Watson"
"Really awesome hoops, feel nice in the hand, awesome grip. Has helped me so much improve my game." "Good quality as fast as always! perfect!" "Got one of your bright orange 30 inch hoops and I am obsessed! My new favourite hoop, lovely weight!" "The hoop has beaten my expectations for my first hoop. although next time i might get a little bigger for learning, however its colour schemes are great and easy to use, It didnt come warped either so no pressing was needed, just opened connected and used straight away." "I received my order within two days. I ordered the fire poi which you make and attach to your own hoop. They work really well. It was quite hard threading the thread into the gauze but I got there and was proud of and happy with my effort. Wish I had got these ages ago! Thanks Home of Poi"